Unique 3800+ sq ft. Corner Townhome, perfectly located on a one-way street, steps from Canton's Entertainment, Eateries, Pubs, and Local Attractions. A block away from the Harbor and Water Taxi. Main level Guest or In-law suite includes Full Kitchen + Separate Living Area and option for private separate Entrance. Total of 5 Bedrooms (all with en-suite Baths) and extra Half Bath on the Main Level. 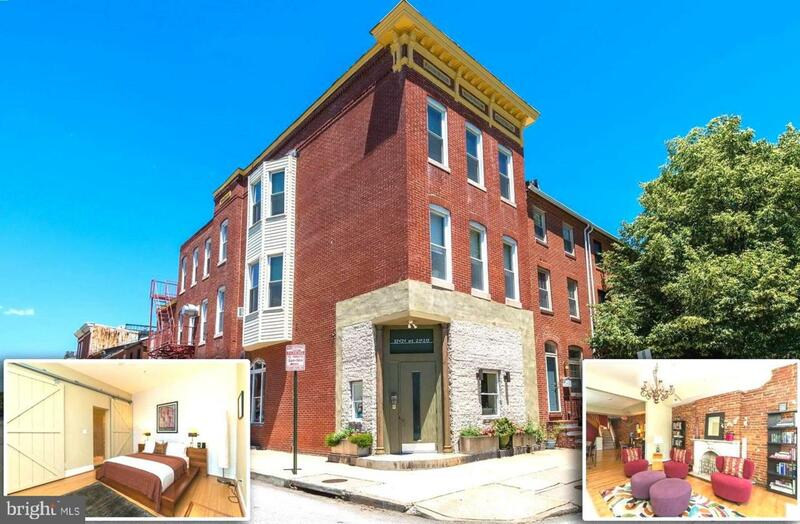 Large Light-filled Living Spaces and filled with Period Charm including 12 Ft Ceilings with Pressed Tin Ceiling on Main Level, 2 Classic Marble Fireplaces and Exposed Brick Accent Walls throughout. Possibilities could include Multi-Family or add a Balcony or Roof Deck to add outdoor space and with impressive views. Buyer would need to verify the feasibility of any changes and the permitting needed. Also listed at 895,000 with Furnishings and Business as a Turn-key Bed and Breakfast.